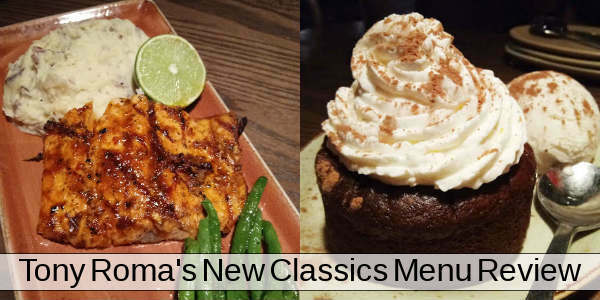 Earlier this week, we were invited to join several other local bloggers to try out the new incarnation of Tony Roma’s, the new Tony Roma’s Fire Grill & Lounge on Lee Vista by the Orlando Airport. Not only does it have a new, warmer, decor, but the menu is new, as well, emphasizing comfort foods and dishes grilled over a wood fire grill. We were prepared to sample the delicious new offerings created by Bob Gallagher, Vice President of Culinary and Purchasing, but we had no idea at how amazing this new menu is. The evening started with a few drinks while we were waiting for everyone to show up. We tried a Wood Aged Margarita and a Swindler, which was a very tasty mix of apple pie moonshine, Fireball whiskey, and housemade sour, with a cinnamon stick for garnish. It tasted like the filling of an apple pie – so yummy!